Staircases used to simply fulfill a basic need, getting from point A to point B, but we also use them to express our creativity and have been for centuries. Although all staircases serve a functional purpose, staircases have also become an artistic outlet used to create a statement. It is common to recognize street art in the form of murals scaling the sides of buildings which transform the outdoors into a colorful gallery. However, staircases get an upgrade as well when artists are commissioned to add more life to them. 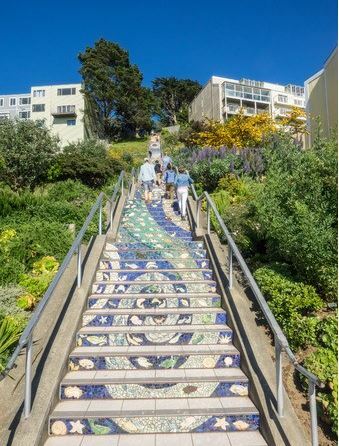 “The 16th Avenue Tiled Steps” were originally conceptualized by Irish ceramist, Aileen Barr, and mosaic artist, Colette Crutcher, and carried out by 300 volunteers. The mosaic and magical transformation took two and a half years, completed in August of 2005. Today the stairs continue to awe visitors and has become a focal point for guests. Albright Knox is a contemporary and modern art museum that prizes itself for housing notorious artists across the centuries such as Van Gogh and Picasso. However, a recent installation framing their staircase is what really intrigues guests. The ground-breaking execution of a concept first thought of by Sol LeWitt in 2006 occurred at Albright Knox in 2010. The project was completed by multiple resident artists that used graphite to scribble on the walls surrounding the staircase. The installation encourages visitors to take their time ascending the staircase to interpret the art for themselves. “The Staircase of the Opera” painted in 1877, by artist Louis Beroud, pays tribute to urban planner Baron von Haussmann’s design within the Opera Garnier. The staircase itself invited socialites to intermingle becoming a symbol of status. The hallways around the staircase adorned with large arches and galleries opened onto the central landing of the stairs provide an unmistakable backdrop appreciated by many. In fact, balconies were even installed to offer additional viewing of the staircase. This staircase is most famously celebrated for its ability to intermesh tradition with modern comfort. All in all, staircases have become an opportunity for expression for artists and architects alike. Why stop at utility when they can offer so much more? Acadia Stairs has helped countless home and business owners improve the aesthetics and functionality of their home or building through our unique, modern and contemporary staircase designs.